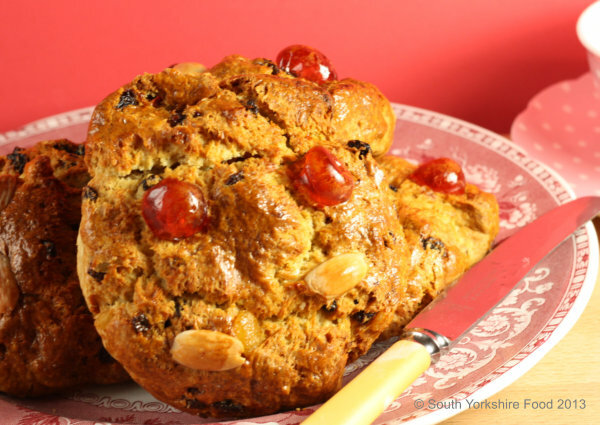 Fat Rascals were invented, and made famous, by Betty's Tearooms in Yorkshire. They are a type of Yorkshire tea biscuit or turf cake, and very similar to a scone. They are terrific, served with afternoon tea, accompanied by strawberry jam, butter and clotted cream, for a touch of indulgent decadence. Makes 6 Fat Rascals. Pre-heat the oven to 220C/200c Fan/425Fand line a baking sheet with baking parchment. Now add the crème fraiche and mix to a firm dough. Roll the mixture out on a floured board, into a cylinder, about 5cms thick, and divide the it into six pieces. Gently roll each piece into a ball and then squash it slightly flat. Arrange them on the lined baking tray and glaze them generously with the beaten egg. Then add two glace cherries and 2 pieces of blanched almond to each rascal, ensuring that they are well stuck on and will not fall off. They will keep in an airtight tin for up to 4 days. Serve with strawberry jam, butter and if you feel decadent, some clotted cream!